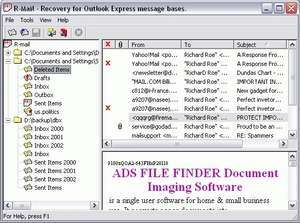 R-Mail for Outlook Express is a tool designed to undelete accidentally deleted Outlook Express e-mail messages and recover damaged dbx files where Outlook Express stores folders with email messages. The messages are recovered in the EML format and can be simply imported into Outlook Express mail and news bases. R-Mail is a family of e-mail recovery utilities for damaged files and deleted messages created by Microsoft Outlook and Microsoft Outlook Express. R-Mail utilities are based on the highly effective IntelligentRebuild Email recovery technology that allows R-Mail software users to repair damaged PST (Outlook) and DBX (Outlook Express) files and restore lost e-mail messages in just three steps. R-Mail for Outlook Express 1.5 is a shareware program and can be used as a demo to try the software until the free trial period has ended. A full version of the program is available after the trial period ends. For security reasons, you should also check out the R-Mail for Outlook Express download at LO4D.com which includes virus and malware tests. Additional screenshots of this application download may be available, too.